The Hyundai Nuvis concept was unleashed at the 2009 New York Show, and it was yet another addition to the magnificent niche of hybrid crossovers, designed to pour in utility, compact-car-fuel economy and sci-fi avant-garde styling into one immaculate vehicle. The Hyundai Nuvis was shaped at Hyundai’s design centre in Irvine, California. The futuristic car sports an SUV style body thus offering generous amount of passenger as well as cargo room almost like a sedan. Along with that, the vehicle stands with a wide stance and a lower roofline lending to the sporty element of the “sport utility vehicle”. 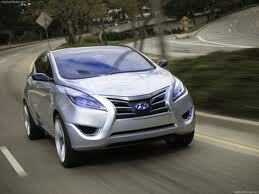 The Hyundai Nuvis concept car is powered by a parallel hybrid system which is backed up by a 270 watt lithium power battery. This dream hybrid crossover has a potential of delivering an estimated 34 mpg city and 35 mpg highway as claimed by the brand, which is on par with the Ford Escape’s city mileage and four mpg extra that its highway mileage. Hyundai’s signature Hybrid Blue Drive system operates analogous to the Toyota’s Hybrid Synergy Drive. The system basically mates a gasoline engine with an electric motor thereby taking off the load on the engine and enhancing the engine’s efficiency. In the case of Hyundai Nuvis, Hyundai’s 228 horsepower Theta II 2.4 liter inline four cylinder engine is combined with a 30 kW motor that is capable of getting the vehicle moving from a stop and also gives in extra power in order to accelerate and pass. What’s more fascinating is that this concept car does not sport any ordinary Theta II engine for that matter. The engine, just like the entire drivetrain, has undergone an optimizing makeover in order to minimize friction that causes loss of efficiency. Hyundai has also brushed up the engine management software for efficiency wherever possible for a further boost up in the fuel economy of the vehicle. Along with all the other enhancing treatments to the SUV, the fourth, fifth and sixth gears of the six speed automatic transmission have been given with an extension to obtain better highway fuel economy. In accordance to what the brand claims, this lithium-polymer battery pack, stored under the rear cargo floor in the Nuvis is more space-efficient and smaller than the nickel-metal hydride or lithium-ion battery packs of rest of the hybrids in the market. The Nuvis, thus weighs just 3400 pounds, according to Hyundai. The brand says their inspiration to style the car came from running water and henceforth the lines and styling of the Hyundai Nuvis make it appear like it is always on the go. The graceful curves and contours get more specified as one looks beyond the pinched nose to farther sides of the car where the creases are smoother and cleaner. Perched on top of 22 inch wheels, the Hyundai Nuvis concept showcases the brand’s cutting edge capabilities, blending attributes of a tall urban car and a premium utility vehicle.